Last weekend I went to a hens party for my lovely friend Kayleigh. The theme was Alice in Wonderland and we were all asked to dress up. I must admit at first I wasn't too keen but in the end i decided to go all out and make my own costume. So here is my dress. I used the black cards from 8 decks of cards which I have sewn together. 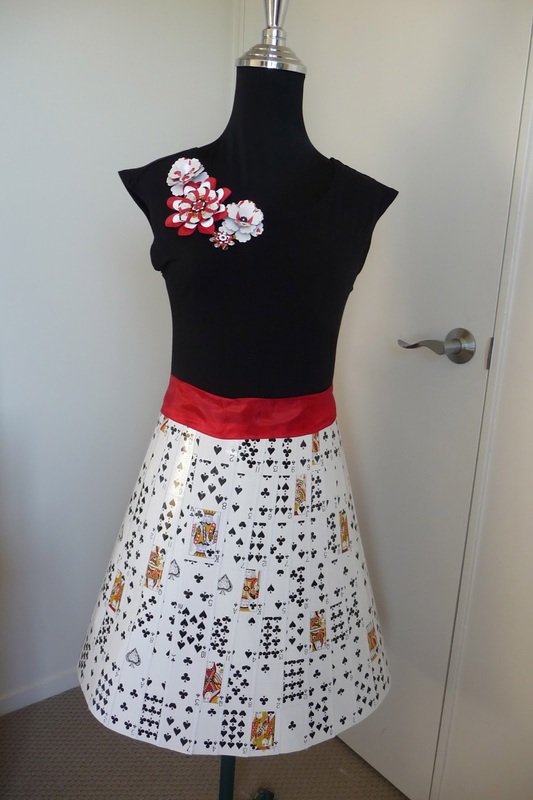 First I made a skirt pattern. Here's Marsh helping me. 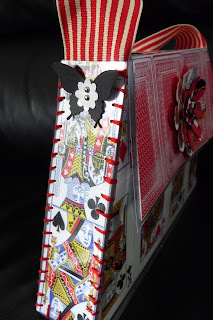 Then I placed cards on the pattern and kept them together with little bits of masking tape. Very carefully I've sewn them together. As I didn't want to risk them coming apart I ran duct tape on the back to strengthen the skirt. 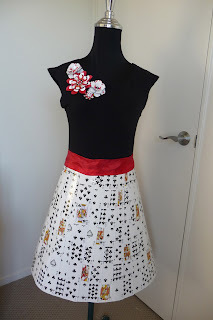 I used my punches and die cuts to make flowers with playing cards and SU card which I hand sewed on. Here we are with Kayleigh (Alice). From left, Julie, Yola, Anna, Lynda, Clare, Jenny, Niki, and me. Kayleigh and Helen in front. No outfit is complete without accessories. I made this bracelet and a handbag. Here is my little bag. It's just big enough for my purse, phone and a lipstick. 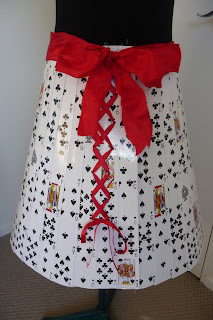 First I made a pattern out of paper which I stuck the cards on to. My lovely friend Kim laminated it for me. I hand stitched it together with embroidery thread. Ha - so fun man. Great idea on the cards and accessories.